Storyline: Del City guard Brett Cannon scored eight points in the final six minutes to rally the West past the East 87-84 before an estimated 1,000 fans on Thursday night at Mabee Center. The West trailed 72-64 early in the fourth quarter. Cannon’s three-point play with 1:08 left gave the West an 85-84 lead. Midwest City’s Torey Noel and Westmoore’s Tripp Fuller each made 1-of-2 free throws in the final 31 seconds. Booker T. Washington’s Kevin Sims missed a tying 3-pointer as time expired. Sims’ three-point play had given the East an 84-82 lead with 1:21 remaining. Sims, who made a 3 at the end of the third period to give the East a 65-62 lead, had 13 points. Game MVP: Cannon, an Arkansas-Fort Smith signee, scored 15 points in the second half. Notable: Union’s Rudy Garcia was named coach of the year by the Oklahoma Coaches Association. 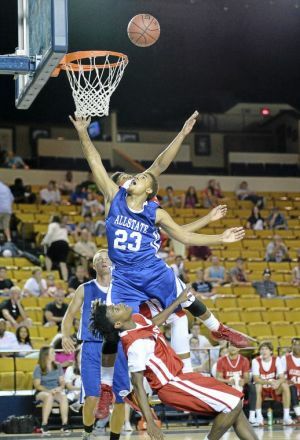 … Oklahoma State signee Mitchell Solomon of Bixby had eight points, 13 rebounds and three blocked shots. … The Large West won for the seventh consecutive year. West: Brett Cannon (Del City) 20, Tripp Fuller (Westmoore) 12, Kesean Brown (Midwest City) 11, Antonio Wilson (OKC Douglass) 11, Mike Jones (El Reno) 8, Dominique Pierre (Lawton Eisenhower) 8, Torey Noel (Midwest City) 7, Luke Lewallen (Elk City) 5, Trace Cook (Lawton MacArthur) 4, Collin Jennings (Harrah) 1. East: R.J. Diggs (Memorial) 17, Shawn Olden (Union) 15, Kevin Sims (B.T. Washington) 13, Demari Edwards (Memorial) 10, Nick Shoemaker (Bartlesville) 10, Mitchell Solomon (Bixby) 8, Matt Lea (Stilwell) 4, Carson Teel (Stillwater) 3, Matt Craig (Bishop Kelley) 2, Travis Hall (Inola) 2. Storyline: Spiro’s Knifeis Carter scored 10 of his game-high 16 points to key a decisive 29-8 run in the fourth quarter as the East defeated the West 72-56 on Thursday night at Mabee Center. Oklahoma City Millwood’s Ashford Golden opened the fourth quarter with a 3-pointer to forge a tie at 43, but Okemah’s John Wingfield answered with a basket and Carter sank a 3 as the East took a lead it didn’t relinquish. Weleetka’s Shawn Bencoma also sparked the East’s late surge with seven of his 15 points in the fourth quarter. Sperry’s Casey Cole added 12 points for the East. Oklahoma City Northeast’s Shawndale Pina led the West with 14 points, but was blanked in the final period. The West led by eight late in the second quarter and 31-25 at halftime before the East rallied. The East have five 3s in the fourth quarter. Game MVP: Carter, a 5-11 guard who averaged 14 points as a senior, was the leading scorer and also set a fast-paced tempo with several assists and steals. Carter is a Carl Albert State College signee. Notable: The Small East won for the first time since 2010. West: Shawndale Pina (OKC Northeast) 14, Ashford Golden (OKC Millwood) 8, Pierson Waugh (Merritt) 8, Jace Kerr (Forgan) 7, Jaz Gayanich (Velma-Alma) 5, Tyler Tune (Arnett) 4, Zach Rayner (Pond Creek-Hunter) 4, Daniel Collins (Fort Cobb-Broxton) 3, Trevor Harris (Laverne) 3, Brady Kokojan (Drummond) 0. East: Knifeis Carter (Spiro) 16, Shawn Bencoma (Weleetka) 15, Casey Cole (Sperry) 12, Austin Guinn (Okemah) 8, John Wingfield (Okemah) 7, Jake Lazenby (Glencoe) 5, Burtchal Griffin Jr. (Haworth) 4, Kade Hayes (Latta) 3, Bryce Deatherage (Red Oak) 2, Caleb Armstrong (Moyers) 0. This entry was posted on August 1, 2014 at 6:02 pm and is filed under COACHES CORNER, NEWS. You can follow any responses to this entry through the RSS 2.0 feed. Responses are currently closed, but you can trackback from your own site.